From the moment we stepped off the plane onto Kenyan soil, we’ve been absolutely in awe of the country, its people and all that it has to offer. Yes, you guessed it; we are currently on the trip of a lifetime and are exploring every corner of East Africa in search of only the very best in luxury safari lodges. What an awful job we have! In amongst whistling thorns, white thorns, fever trees and wild olives the great plains of the Masai Mara are home to many of Africa’s most majestic animals. The red grass savannahs, interminable vistas and distinct horizons combine to ensure the most quintessential African panorama. The density and variety of wildlife is unreal, with often more than ten different species of mammals in one spot, an anomaly that is unheard of elsewhere. 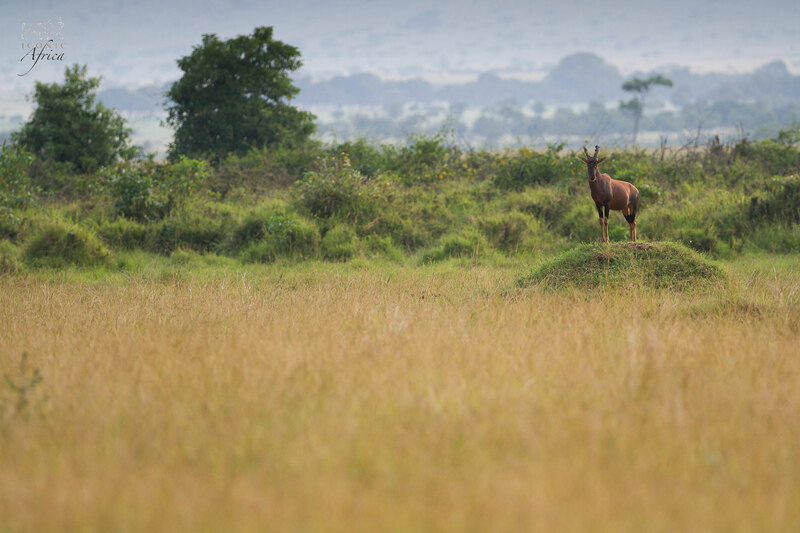 The Mara boasts hoards of unique antelope such as the graceful Thompson’s and Grant’s gazelle as well as the colourful topis making it the ultimate predator’s paradise. Everything, in absolute abundance! So far we have been lucky enough to visit Naibosho Camp, Mara Plains, Kichwa Tembo and Angama Mara. The ultimate in luxury safari accommodation but each with its very own heartbeat, style and charm. Naibosho is the ultimate, award-winning eco safari; Mara Plains, the pinnacle of colonial African indulgence; Kichwa Tembo, an all round Kenyan experience; and last but certainly not least, Angama Mara, the definitive in Kenyan hospitality boasting undoubtedly, the best views of the Masai Mara. There is just so much to tell you and we can’t wait to share all the awesomeness, but until then, below are a few pictures from our last couple of days in the exquisite Mara Triangle. In the meantime it’s that time of day… time for our daily G&T. We clink glasses and cheers: “Maisha Mairefu,” Swahili for “here’s to a long life.” The light fades, the sun sinks below the horizon and the colours that light up the savannah are magical, giving way to an endless starry night, filled with the sounds of lions roaring and hyenas calling. We go to sleep in anticipation of the very next surprise that this magnificent land and its ever-smiling people have in store for us. A fairly common sight in the Masai Mara; a topi antelope atop a termite mound. Male topis will often display by standing on these visible vantage points; it helps them see rivals or danger approaching and acts a visual sign that the territory is taken. A young spotted hyena sniffs the wind as he comes to investigate the vehicle. 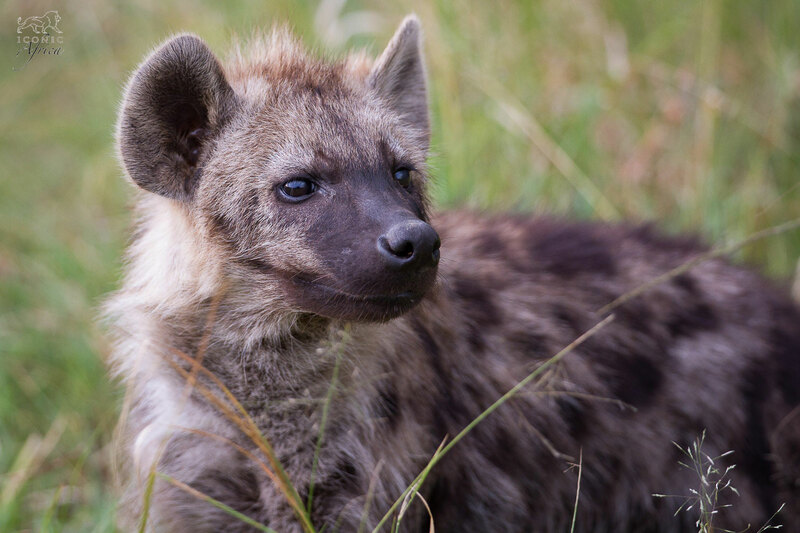 Young hyenas are very curious animals and will venture further and further from their den to explore as they get older. 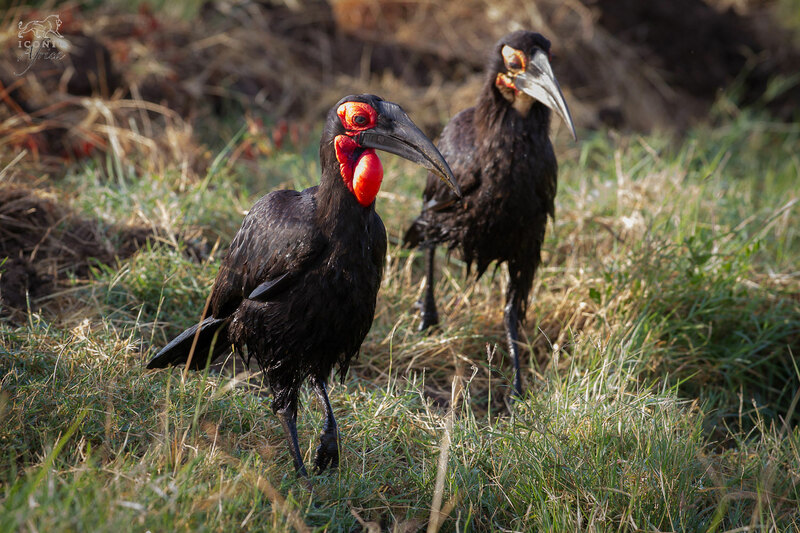 Two southern ground hornbills on the prowl for food. The one at the back with the yellow throat is a juvenile, and the whole flock will actively participate in raising it. Only one chick is ever raised at a time. 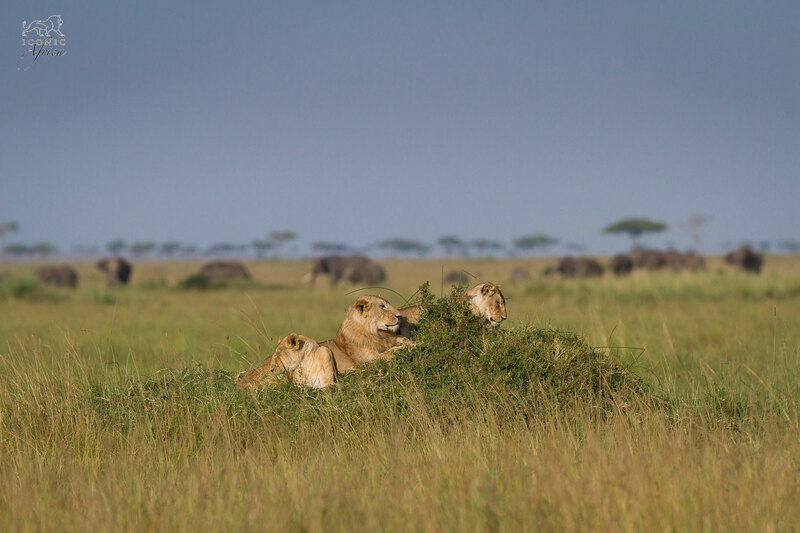 A pride of lions watch a herd of topi in the distance while a breeding herd of elephants grazes in the background. Long grass at this time of year reduces visibility for predators, and they are forced to seek higher ground in order to identify hunting opportunities. A grey crowned crane. 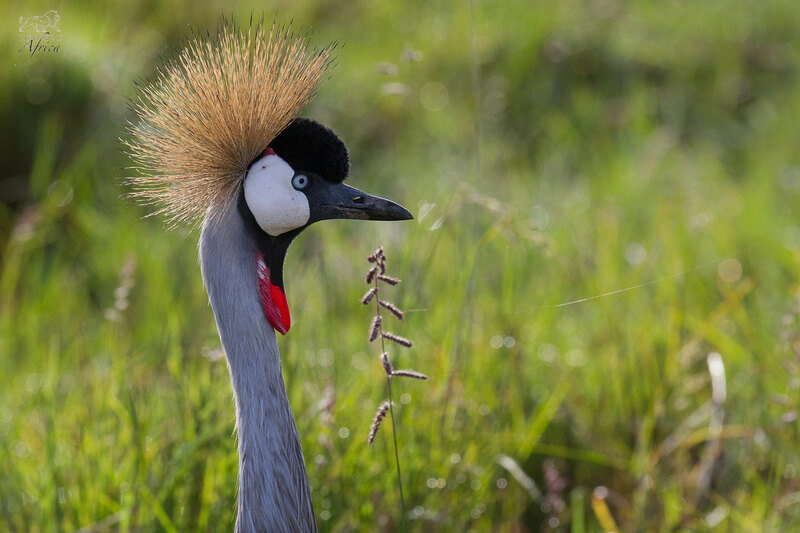 Uganda’s national bird, these exquisite specimens of the avian world are fairly regularly encountered in the open plains and marshland that characterises much of the area surrounding the Mara River. 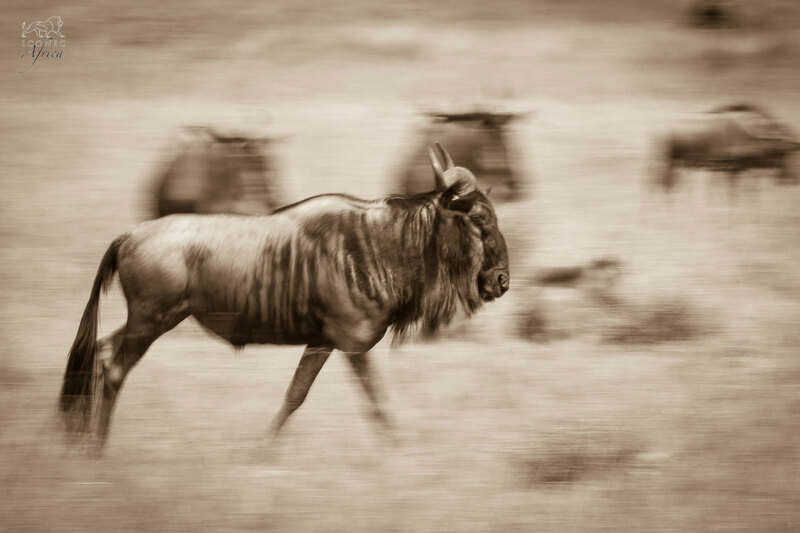 A male wildebeest rushes around in an attempt to chase younger males away from his females. The front-runners of the migration have started trickling into the Maasai Mara from Tanzania, and they will soon be followed by a tide of over a million wildebeest and zebra. 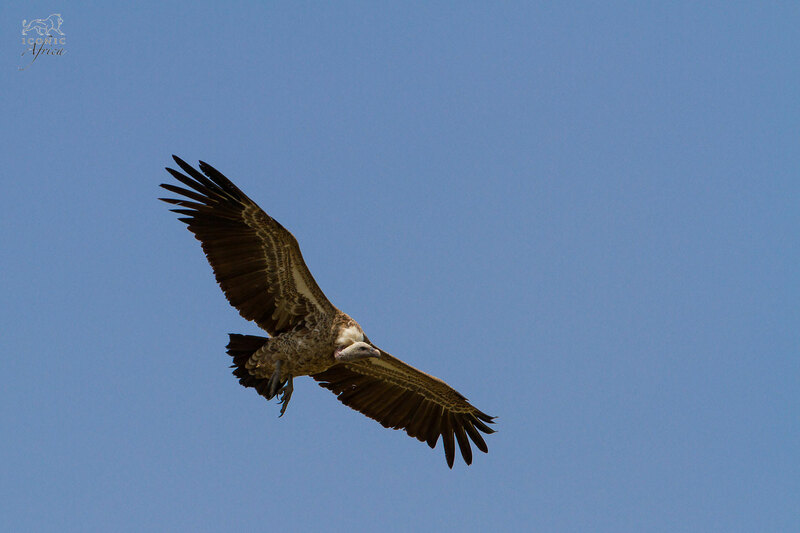 A Ruppell’s griffon swoops down to join other vultures on the carcass of a wildebeest. These large birds lower their legs as they approach the ground; this helps them slow down as they come in for a landing. Whilst Ruppell’s griffons and white-backed vultures squabble over a zebra carcass in the foreground, another bird comes in for a landing behind them. 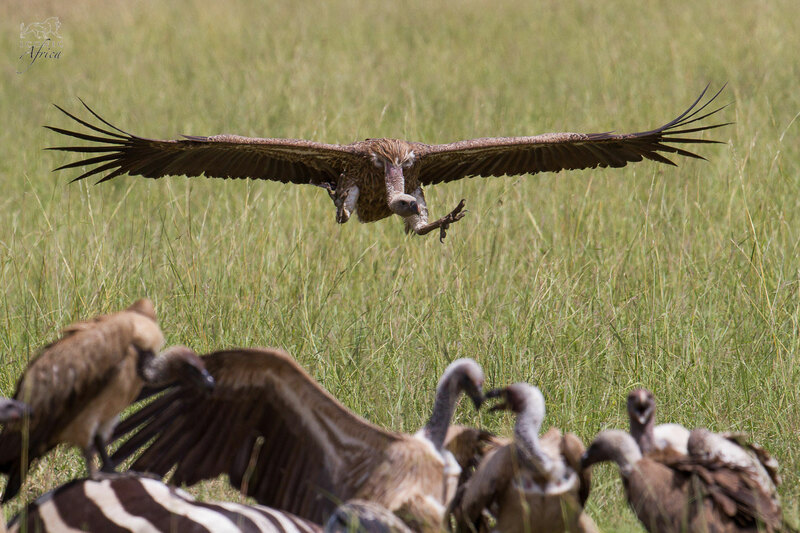 Seeing vultures descending during the wildebeest migration is a sure sign that there isa carcass on the ground, and possibly predators as well. A herd of elephants trudge slowly through the grasslands towards the escarpment in the distance. 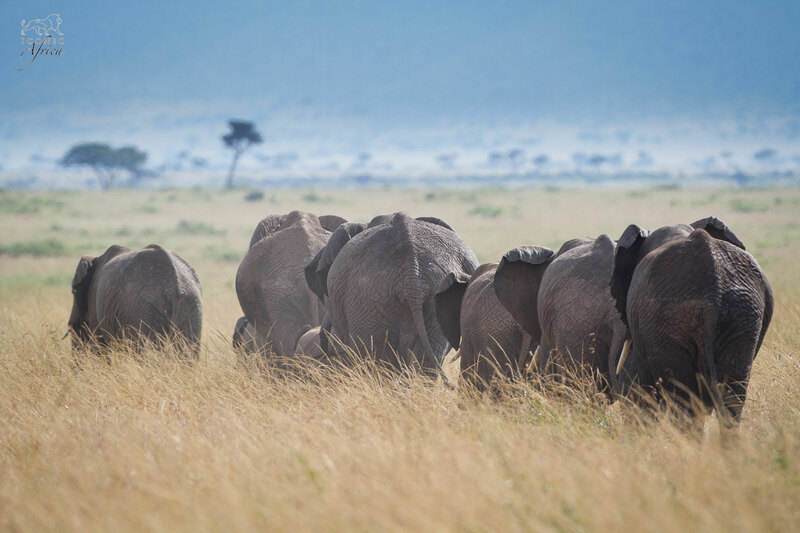 Elephants are mixed feeders – able to graze and browse – and will take advantage of whatever the conditions are offering at the time. A Cape Buffalo enjoys a mud wallow whilst a second feeds on the rich green grass in the background. 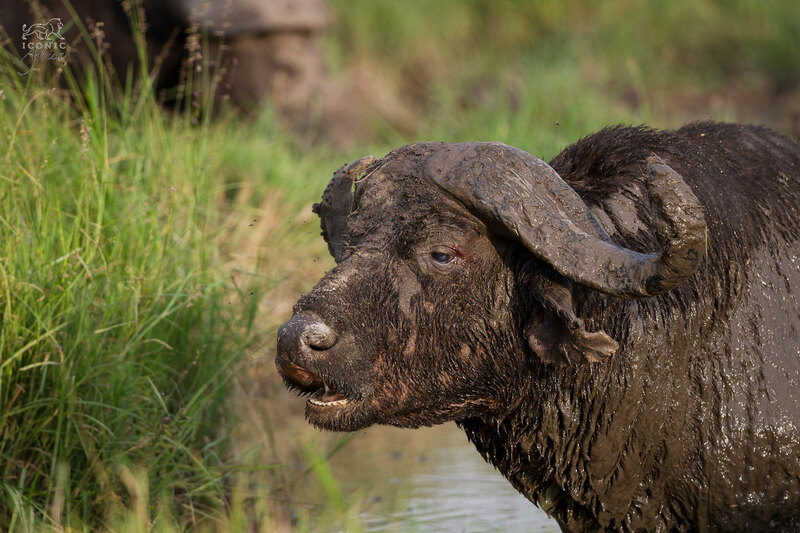 Buffalo, as well as other animals like rhino and warthog, will often roll in mud to try and stay cool, as well as protect themselves from parasites. It is only day 4 of 14 and we cannot believe the experiences we’ve had, the game we’ve seen, the places we’ve stayed at and the laughs we’ve shared. The trip has been nothing short of amazing and it’s only just begun! Watch this space… with love from East Africa. Oh, AMAZING!!!! Looking forward to seeing the lodges!! Enjoy your time; I do envy you! !